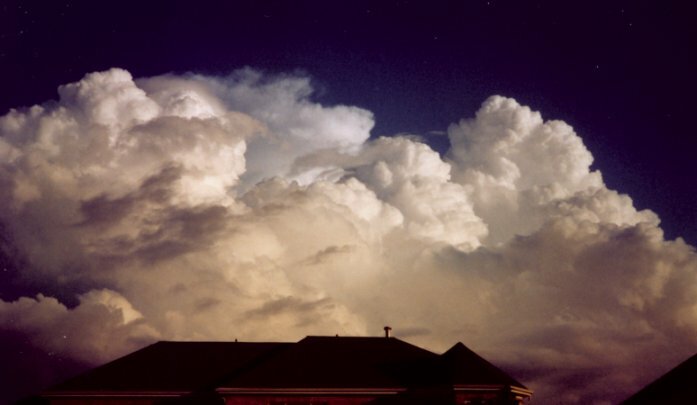 Photo of the Week.. A huge summer cloud billows to the sky. Astronomy news for the week starting Friday, July 25, 2003. The Moon wanes in its crescent phase the early part of the week, passing new the night of Monday, July 28, about midnight in the Americas. The slim waxing crescent will be technically visible in the west- northwest the night of Tuesday the 29th, but very difficult to see; the following night, however, it will be obvious. Watch the phase grow, the nighttime lunar side bathed in Earthlight, over the following couple of days. Many are the pairings of the Moon and planets, though most are difficult to see. The night of Saturday, the 26th, the Moon passes the north of Saturn, this one visible as the ringed planet is now rising shortly before dawn begins. The morning of the 26th, the Moon will be a bit to the west of Saturn, the following morning a bit to the east. Following new, the Moon then passes Jupiter and then Mercury on Wednesday, the 30th, neither planet up high enough in evening twilight to see without special effort. That same day, Mercury makes a very close pass to the north of the star Regulus. More intriguing perhaps, Jupiter and Mercury are in conjunction with each other, Mercury only half a degree to the north of the giant planet, as our week begins, the evening of Friday the 25th. With these events and planets too close to the Sun for easy viewing, the week belongs to reddish Mars, which now rises brilliantly, brighter than the brightest star, around 10:30 PM Daylight Time. Closing in on its opposition to the Sun on August 28, the planet begins its retrograde -- westerly -- motion against the stars of southern Aquarius on Wednesday, the 30th. Watch as it backtracks, and quickly rises ever earlier in the east-southeast. This is the season now to look to the east in early evening, to admire the great Summer Triangle marked at its western apex by Vega (in Lyra, the Lyre), at its southern by Altair (in Aquila, the Eagle), and at its eastern by Deneb (in Cygnus, the Swan). Though Deneb, at the tail of the celestial Swan, seems the faintest of the three, it is by far the most distant, and therefore by far intrinsically the most luminous, indeed, it is one of the more luminous stars in our entire Galaxy, first magnitude even though as much as 2600 light years away, the light you see having left the star as early as 500 BC. By contrast, Vega is a mere 25 light years distant, the three-dimensional view of the sky difficult for anyone to really imagine. In a dark sky away from city lights, with no Moon, the Milky Way glows brilliantly as it flows from Cygnus through Aquila and down to Sagittarius and the southern horizon.